Dear Kate, thank you for your beautiful drawing of our house. 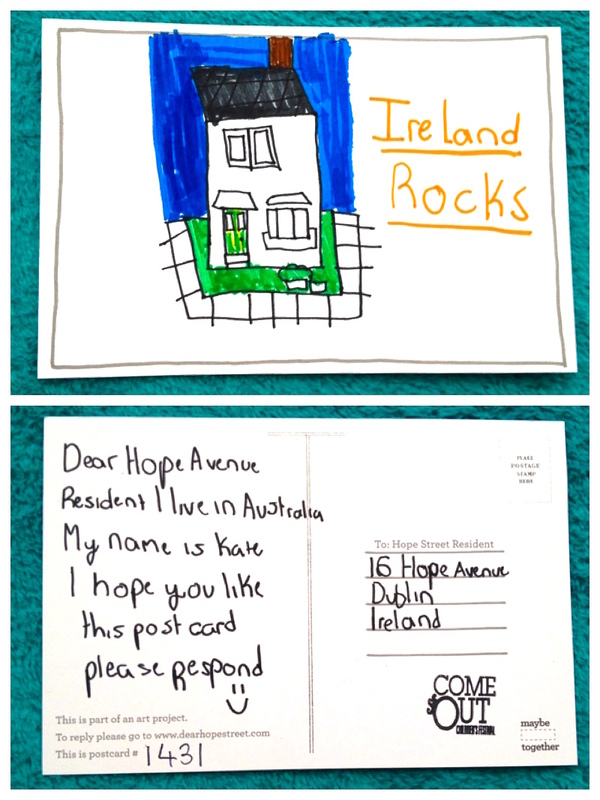 Ireland certainly does rock and we love our little house here on Hope ave. This house is very special to us as it belonged originally to my husbands great grandmother. Actually our house is 90 years old today! It was built by a man called Canon Hall also know as the building parson, a very good man who got these houses built to get very poor families out of living in tenement houses in Dublin City where very big families would live in just one room and share an outside toilet with lots of other families! When my husbands great grandmother lived here and had children one of them, (my husbands grandmother) bought the house directly behind so she could come and go from her mothers house through the back gardens. That house was on the street behind and is called Faith Ave, that is where my father in law grew up. My husbands grandmothers sister, Alice,never married and stayed living here on Hope Ave all her life. The two sisters would visit each other still through the back gardens. Unfortunately Alice became unwell had had to go into a care home when she was in her 90s and so myself and my husband moved into this house (that was about 4 years ago) to take care of the house and it was nice being so close to ‘Nana’ who we visited through the back gardens! Aunt Alice passed away the following year and her house was up for sale and we bought it! In the same week we signed the final papers for the house our beautiful little daughter arrived and we named her Alice! We then had to move out for a few months so we could renovate the house very little had been done with the house since the 1950s! We kept a lot of the originally features like the beautiful little fireplaces in the bedrooms but it is now quite modern inside thanks to all the hard work my Husband and my Dad did with it! Nana has since passed away and her house on Faith Street has been sold but it’s nice we still have the house where she grew up still in the family. Baby Alice is now 3 years old and in January her baby brother Jacob came alone and so were are a family of four here in our lovely little cosy house. I think this is a lovely project! We got a postcard once before I think it was last year or the year before perhaps, we still have that one and we are going to frame them and put them up on our wall.